Does Washington Square Park “feel haunted”? More… WSP Blog breaks story of discovery of 18th century tombstone at the park earlier this year during Phase II construction. Was a Tombstone Discovered Today at Washington Square Park While Digging Up Southwest side? As many people know, Washington Square Park was previously a burial ground – a “potters field” – from 1797-1825. It is believed that up to 20,000 bodies were buried there at that time. 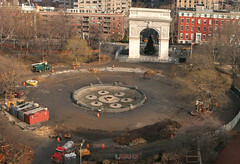 During Phase I redesign construction in mid-to-late January of 2008, workers found at least four intact skeletons and 70-80 human bones (See Previous WSP Blog post: The Skeletons of Washington Square Park). Construction work began over the last few weeks on Washington Square Park Redesign: Phase II (focusing on the Northeast, Southeast and Southwest parts of the park). Now comes word from a blog visitor who walked by the park today that he saw a tombstone uncovered there. Any more information on this? Do you have any information on a tombstone that was uncovered today in WSP at the corner of Sullivan and West 4th Street? I saw the back of it with my own eyes being dusted and photographed inside the chain-link fence. The small crew were very tight lipped. Note: Check back! I will find out more information if available.